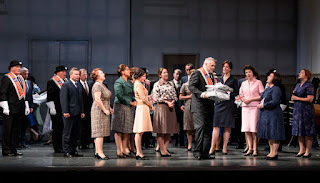 Vividly gripping drama is perhaps not phrase which you might expect to be used to refer to Bellini's I Puritani, but that was the phrase which came into my mind after seen Annilese Miskimmon's new production of the opera, presented by Welsh National Opera at the Wales Millennium Centre on Sunday 4 October 2015. Carlo Rizzi conducted, with designs by Leslie Travers, lighting by Mark Jonathan and choreography by Kally Lloyd Jones. 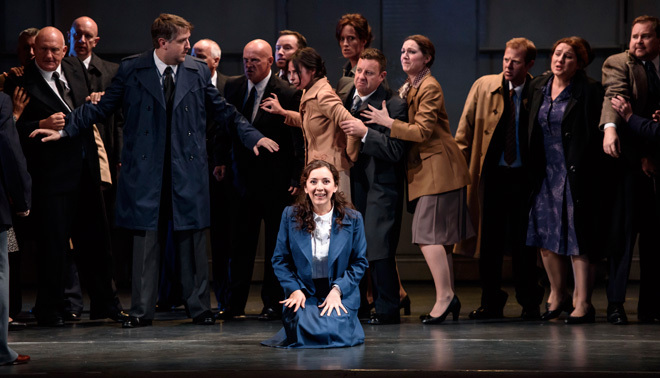 Rosa Feola was Elvira, Barry Banks was Arturo, with David Kempster as Riccardo, Wojtek Gierlach as Giorgio, Simon Crosby Buttle as Bruno, Aidan Smith as Gualtiero and Sian Meinir as Enrichetta. Bellini's final opera was written for Paris, and having fallen out with Felice Romani librettist of his previous operas including Norma and La Sonnambula, Bellini was forced to rely on Count Carlo Pepoli who happened to be resident in Paris. Pepoli's libretto has some strong situations, but overall the drama is full of holes and, despite Bellini's superb music, directors often struggle to create drama out of the piece. Andrei Serban's much travelled production, originally created for WNO in 1982, took the drama at face value and set the piece in 17th century England relying on strong performances from the principals to hold the drama together (when I saw the production in Amsterdam, I'm afraid it occasionned a number of laughs from the audience). 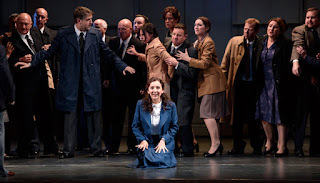 More recently, Stephen Langridge at Grange Park Opera in 2013 (see my review) seemed to struggle to create a coherent drama at all and relied on strong musical performances. Part of the problem lies in the fact that the story, set in 17th century Plymouth amidst the conflict between Cavaliers and Roundheads, rather struggles if taken out of context. Annilese Miskimmon's brilliant solution is to move the plot to Northern Ireland in the 1960's, with Cavaliers and Roundheads replaced by Catholics and Protestants. Act One takes place in an Orange lodge and the war, which the men refer to, is the on-going struggle with the Catholics. Of course, the way the opera has Elvira (a Protestant/Roundhead) marrying Arturo (a Catholic/Cavalier) is completely improbable in the context of 1960's Belfast. Miskimmon solves this by having Elvira be subject to hallucinations from the start, seeing a 17th century version of herself. 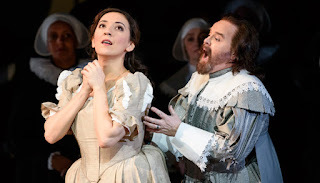 At the moment when the chorus welcomes Arturo towards the end of Act One, the drama takes a lurch as Elvira's mind fractures and suddenly there are two Elviras and one is firmly 17th century with the welcoming chorus similarly clad. The silent Elvira is a spectator as the action takes place in an increasingly 17th century milieu, and her fractured mind is reflected in the way the scenery itself becomes distorted and fractured. Act Two is set entirely there, and as Act Three returns to the 1960's, we still get flashbacks. Arturo's return is not welcome, and Elvira's mind remains fragile. In the brilliant denouement, as Arturo is killed by the Protestants, the Royal pardon occurs solely in Elvira's head (the messenger is firmly in 17th century costume and seen only by her) and the rapturous finale sees the chorus triumphing over the dead Arturo whilst Elvira is away with the fairies. 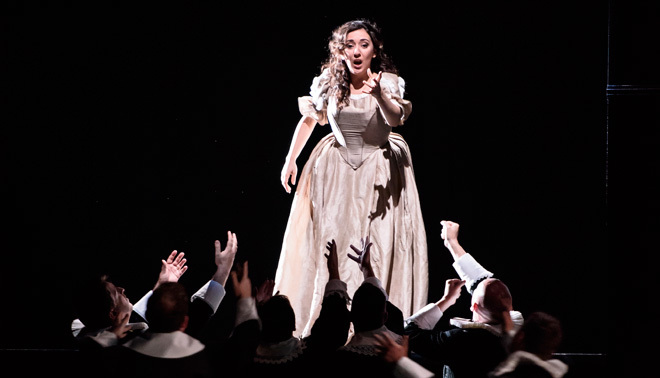 The central problem of the opera is Act Two, which is entirely static and brings nothing new. Miskimmon and designer Leslie Travers set it in a larger, plainer and more stylised 17th century version of the Orange lodge, with costumes firmly 17th century. Mark Jonathan's lighting is dramatic and Miskimmon's personenregie ensures that the whole act is about Riccardo's guilt at allowing Arturo to escape at the end of Act One, thus bringing on Elvira's mental collapse. The final duet Suoni la tromba between Riccardo and Giorgio (in 17th century costume) was accompanied by a visual coup as as the men of the 1960's Orange lodge marched slowly across stage with their banner, and suddenly the war which Riccardo and Giorgio sung about took on entirely a new meaning. It helped of course that this dramatic intelligence was partnered by a superbly musical performance from the cast. Rosa Feola, making her debut with Welsh National Opera, was coruscating as Elvira. Feola seems to have sung mainly coloratura/lyric roles but here combined a fluency in the coloratura with a great sense of strength. Not quite a spinto performance, but something in that direction; this Elvira was no demented canary, and Feola made Elvira's madness truly a reality whilst giving us a superb series of fioriture and roulades, and a stunning sense of line. Technically adept, she folded the ornamental elaborations into the very fabric of the vocal line as Bellini intended and brought a scary intensity to the whole performance. She was superbly partnered by Barry Banks in fearless form as Arturo. He brought his familiar sense of strong line to the part and was certainly not scared of the high tessitura. I loved the way he combined this with a feeling of musical drama, and responded to the intensity of Feola's performance. The gentler moments, like Act Three's Vieni fra questa braccia had a lovely gentle caress to the line, but elsewhere it was clear that this Arturo was a fighter too. Wojtek Gierlach was a younger than usual Giorgio, made a Protestant minister in the 1960's which makes sense of his calmer, more rational point of view. 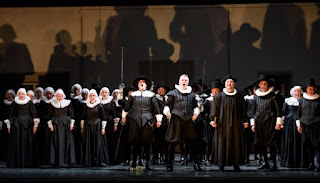 Gierlach had a nice way round Bellini's lines and contributed superbly to the various ensembles and duets which he was part of, thrilling at the right moments and intelligently supportive at other. David Kempster was frighteningly intense as Riccardo, both in the 20th and the 17th centuries, combining this with a lovely feel for Bellini's lines. Gierlach and Kempster's duet at the end of Act Two was rightly thrilling musically and balanced Miskimmon's introduction of the Orange lodge march brilliantly. The smaller roles were all well taken, with Simon Crosby Buttle as Bruno, Aidan Smith as Gualtiero and Sian Meinir as Enrichetta. They and the chorus brought a frightening intensity to the 20th century scenes and made the 17th century Protestants scarily serious and accusing. 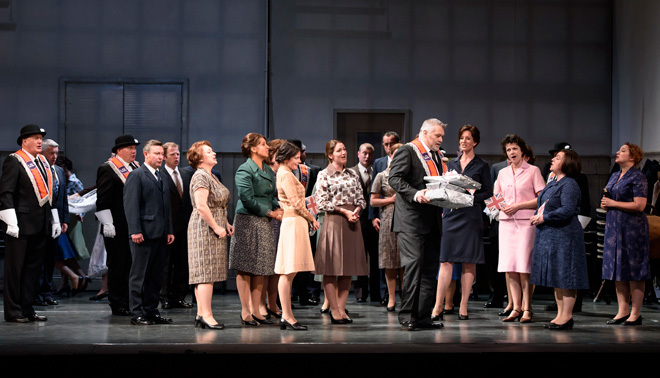 In the pit, the WNO Orchestra played superbly as ever for Carlo Rizzi, a former musical director of the company. Rizzi showed great sympathy with Bellini's music, but the sympathy and space for the singers never degenerated into self-indulgence. The orchestral contribution was as taut and as fluid as the drama on stage. 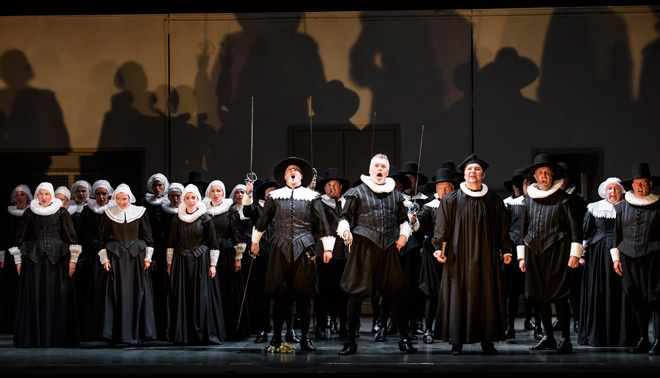 This performance was a notable achievement for WNO and all concerned, bringing a new sense of drama into Bellini's opera but never losing the essential quality of the music. This always sounded like Bellini, with a superb sense of line and fine ornamentation. It helped that Miskimmon had a clear sense of what is, and is not, possible in updating an opera. Whilst the 20th century scenes were firmly realistic and almost naturalistic, Miskimmon always made room for the singers and the extra action never pulled focus from the music drama. At all the key moments, we were free to concentrate on what counted, the musical performance.